Departed Hanoi in a Toyota cruiser 4-wheel drive vehicle for Son La via Mai Chau district to visit Ban Lac. (Ban Van  Muong Hill tribe  shown on the itinerary not visited). Overnight in Son La. A gallery of textile photos taken in a Ban Lac, Mai Chau district, Hoa Binh (Ha So'n Binh) Province, half a day's drive to the west of Hanoi, during a journey in 1995. See also Black Thai Vietnam photogallery. Unfortunately as we had a long drive still to do that day we then had to leave the village and carry on to Son La down a pretty rough road. We saw several Hmong (possibly Flowery Hmong or Black Hmong) and I managed to take a limited number of photos. A few photos of Hmong - in Son La province on a journey through northwest Vietnam in October 1995. The photos was taken along the road from Moc Chau to Son La in Son La Province quite close to Mai Chau district in Hoa Binh province. It was nearly 7.00 p.m. before we arrived in Son La. Son La to Dien Bien Phu. Son La is a (Black) Thai area. The women wear a head dress which looks as if it is supplementary weft weaving but is, in fact, embroidered on a plain indigo woven cloth. We visited the Son La museum which included a display of minority costume and where I bought a (very expensive at US$7) Black Thai head cloth. I took a few close-up photos of Black Thai women selling produce at the bottom of the road down from the museum. Stopped at a market for photos mid-morning which was possibly Ban Vay where I bought a head cloth for 25,000 Dong (but it may have been only about 3,000 to the locals). A gallery of photos taken in the north west of Vietnam in Son La and Lai Chau provinces especially in and around the town of Dien Bien Phu during a journey in October 1995. See also Thai Weaving Village photo gallery. We carried on over a very bumpy road most of which was not made up. There was not as much traffic as there had been on the road from Hanoi to Son La. There was beautiful scenery  range after range of mountains with beautiful fertile valleys farmed by the Black Thai. We stopped to photograph a Black Thai woman with her children who was putting cotton bolls through a wooden machine (cotton gin) to crush and de-seed them. We went over the highest pass in Vietnam to Dien Bien Phu. Dien Bien Phu is a dusty town which, at present, is very much a building site. It has just been made the capital of Lai Chau Province. The hotel, at first, said that they did not have a room with a loo because a party of dignitaries had arrived. Long had to pay some additional dollars to secure the room when I said that it was important. The room was not as good as the one at Son La and had no bath. The lighting was very poor and I had to sit in the bathroom to read by the bathroom light. During the evening various men tried to burst in en route to the public loo next door! Despite this I had a reasonable nights sleep. 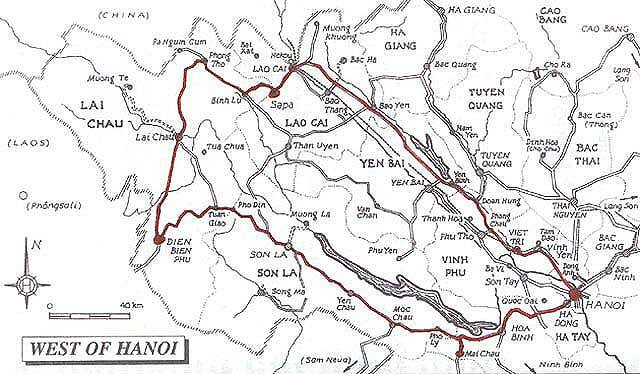 Dien Bien Phu  visits to Black Thai weaving villages in surrounding area. After breakfast we went on an arranged visit to a Black Thai village after picking up a local guide. We went up into a house and the Black Thai lady showed us her weaving. I bought a woven bag (40,000 Dong). She had dyed the silks and (red) cotton herself with (what looked like chemical) dyes - bought locally. Her head cloth she had woven and dyed herself with indigo which grew locally. She had a large roll of the red woven (bag) fabric which was kept for use as needed  e.g. for bags, bedding, seat cushion edging and edging the top of room dividing curtains. I was pretty sure that I saw patchwork on the top of one curtain. She offered a strong drink  a kind of white liqueur spirit. Afterwards we went for lunch and had some good barbecued beef. After a rest we went off to another Black Thai village nearer to the head of the valley. We walked across a path through the rice fields and it was peaceful and beautiful. Birds sang and the crickets called. We went through the village and went into two of the houses. One, where there was a loom, two girls did some weaving for us. The mother was winding the silk thread from the dyed skein into a shuttle. There was cotton and possibly silk in bags in the roof waiting to be spun. Outside were hanks of plain un-dyed thread waiting for weaving/dying. I bought a face cloth (30,000 Dong) which had been embroidered on natural cotton by one of the girls, who was 17 and had demonstrated weaving for us. I also bought a bag (Dong 50,000). At the second house I spotted some cloth which had been dyed with indigo and was at quite an early i.e. relatively pale, stage. I took a photo of a grandmother with a baby in a baby carrier on her back. I had earlier taken a photo of a baby carrier hanging out to dry on a line outside this house. I bought a head cloth (60,000 Dong). They were all very hospitable and it was very beautiful and peaceful. In the evening we collected the guide from the morning. She turned up late having had an accident on her motor bike. She had changed into traditional Black Thai dress. We had dinner in the house which we had visited in the morning. The man of the house was the local communist party secretary and purportedly a friend of the Prime Minister. The food was traditional Thai which was rather dry with solid meat and sticky rice. Alcohol was important, especially making toasts  one glass for the favoured guest and one for their family. After the meal started a drum started beating calling the people to dance. In the Thai community this can be for any festival but apparently amongst the Hmong the drum is only beaten at the time of a death. Girls danced  all in their best clothes  and were very graceful, looking talk and slim in their long black silk skirts, bright plain coloured blouses and hair in loose knots on top of their heads secured with an old coin. Long and I danced with them and tried to beat the drum. (The evening cost me US$50). We left Dien Bien Phu about 8.00 a.m. next morning. The itinerary said that we would stay the next night in Lai Chau but Thanh and Long advised against this. It is a very sleepy town and no longer the capital of Lai Chau Province. The road during the day was very mountainous with different mountain profiles than along the road before Dien Bien Phu. There was hardly any traffic and very little habitation and it seemed much poorer. A gallery of photos taken in a Red Hmong village in Lai Chau province, northern Vietnam, during a journey in 1995. See also the photogallery of Green (Blue) Hmong, Thailand whose clothing has close similarities. A cat at the place where we later stopped for lunch had a miaow like a Siamese and had one blue eye and one amber one. Near to Phong Tho (Phong Thanh), where we stayed for the night, we stopped at a Flowery Hmong village where I was attracted initially by clothes handing on a washing line to dry. I photographed a pleated skirt and was offered one for US$50 which I declined. A gallery of photos of Flowery (Variegated) Hmong taken in Son La, Lai Chau and Lao Cai Provinces on a journey through northwest Vietnam in October 1995. The first group of photos was taken along the road from Moc Chau to Son La in Son La Province. The next groups were taken in and around the town of Phong Tho (Phong Thanh) in Lai Chau Province and the last in and around the town of Sa Pa, Lao Cai Province. Phong Tho (Phong Thanh) to Sa Pa. We left the hotel at 7.30 a.m. and had breakfast. We then went to visit a Nhang minority village  Nam Luong. It was pretty poor. They were very welcoming and hospitable and asked Long and myself in for tea. They are a very small group and came more recently from China. Apparently their language is very close to Chinese. We then drove to Sa Pa. The drive was very scenic with some of the most beautiful scenery that I have seen on the trip. Checked in at a reasonable hotel at 11.30 a.m. Saw a few small groups of minorities on the road. A small group of photos of four Phula girls from the Xa Pho sub group taken in Sa Pa, Lao Cai Province, northwestern Vietnam in 1995. I had a wander around the town on my own and walked up a hill overlooking the town. I bought a length of plain indigo cloth (30,000 Dong) and a Black Hmong sash (80,000 Dong). Long then came to have supper with me. Overnight in Sa Pa.
We drove out of town and Long and I walked to a Black Hmong village and had a cup of tea and saw lots of children near their school. A gallery of photos taken in the north west of Vietnam in and around the town of Sa Pa, Lao Cai Province during a journey in October 1995. See also Black Hmong baby carriers photogallery. A gallery of photos taken in and around Sa Pa, Lao Cai Province in the north-west of Vietnam of various Red Dao during a journey in 1995. See also Yao (Mien) photogallery from Thailand which is part of the same ethnic grouping and there are close similarities in some of the clothing. As we walked back towards Sa Pa we fell into step with a very intelligent and courteous 8 year old Black Hmong boy (who was 4th in his class at school). We got back to the pick-up point at 12.30 to wait for Thanh who was due at 1.00 p.m. He drove straight by us and up the track. After he drove past us he had an accident with the Toyota and it slipped into a drainage ditch when the road gave way. He had to get 6 Hmong men to pull him out. A small gallery of photos showing details of embroidery, batik and appliqué on a Black Hmong baby carrier and how it is worn. The baby carrier featured was collected in Sa Pa, Lao Cai Province in northern Vietnam during a journey in 1995 when the photos of the Black Hmong mother, grandfather and their babies were also taken in and around Sa Pa. See also Black Hmong photogallery. In the town I saw a very bright costumed lady Miao Ba Ha (probably Flowery Hmong) [Hmong 3] who was apparently from the north of the region near the Chinese border and was in Sa Pa to attend a school. We visited a village  Luong  and went into a house which was either Nung or Dao Quan Trang and saw a girl weaving piece of braid. This was being woven with the weaving secured to her big toe. We first had a cup of tea and then, eventually, we were able to get her to demonstrate the weaving. One of the sons of the house came in wearing his machete secured by a similar braid strap. Before we left I was able to buy a used length of braid strap (although they wanted to sell me a new one which Long bought.) Apparently Bu was the head of the household and he had 12 children and very many grandchildren. The inhabitants of the house were not wearing traditional dress. It was suggested that this had been a Nung household. However, at a house oposite there were clothes handing on a washing line and then a family looking over the balcony at me fascinated by their washing. They, I have subsequently realised, were wearing the costume of the Dao Quan Trang (Dao with white trousers). The braid which the 'Nung' girl had been weaving was very, very similar to the traditional braid belt what is worn around the Dao Quan Trang women's jackets to hold them closed. I was frustrated not to be able to get any good photos in this village of traditional costume. I took some of the rather tired clothes on the washing line including the long embroidered bib which hangs down the front of the womens clothing. I alos took a photo of the family watching me from the verandah of their house  with the two women wearing traditional dress - and one girl threshing in the field. A small gallery of photos taken in Luong village, Lao Cai province in 1995 shortly after leaving Sa Pa for the town of Lao Cai. Dao Quan Trang or Dao with white trousers which refers to the white trousers worn by the women for weddings. On the way down from the mountains around Sa Pa towards Lao Cai, a town near the Chinese border, we stopped briefly at a local market where some Flowery Hmong were selling  as it turned out  clothes and batiked fabric. I bought a batik skirt length and a machine appliqued apron. Unfortunately I was not allowed to stay long as we had a long drive to do. We drove about 300km. The morning was very long and tiring. I did not feel too good. We ended up in a large town, Viet Tri, for the night. According to the itinerary we should have gone to Thai Nguyen for the night  and visited a museum there with a good collection of minority costume  but Long was keen to get as close to Hanoi as possible as he had to set off with another tour almost immediately the next day. Travelled to Hanoi arriving just after 10 a.m.
After lunch at the hotel (Hanoi Hotel) I took a cyclo to Hang Gai Street in the old sector of the city and managed to find the Gallery Natasha again (owned by a Russian woman married to a Vietnamese) that I had found the previous year. She was very interested in the Thai weaving and drove out  possibly to the Mai Chau district  to purchase weavings for the shop. I bought some (Southern) Thai fabric (possibly white Thai)  some older weaving, perhaps 6 or 7 years old; 3 cushions  one new and the other two, perhaps a couple of years old; a Nung bag (made as part of a development project); a piece of weaving by Tays. I found another shop with some Hmong/Dao pieces. Mostly coats made for tourists from Black Hmong fabrics. However, there was one nice Black Hmong boys jacket  supposedly for a wedding but similar to those worn every day around Sa Pa  which I bought for US$30. Collected: Southern White Thai possibly from Mai Chau district older weaving, perhaps 6 or 7 years old; 3 cushions  one new and the other two, perhaps a couple of years old; a Nung bag (made as part of a development project); a piece of weaving by Tays. I spent 750,000 Dong.